HLW International created an inspiring and versatile design for Capital One‘s new London-based offices. 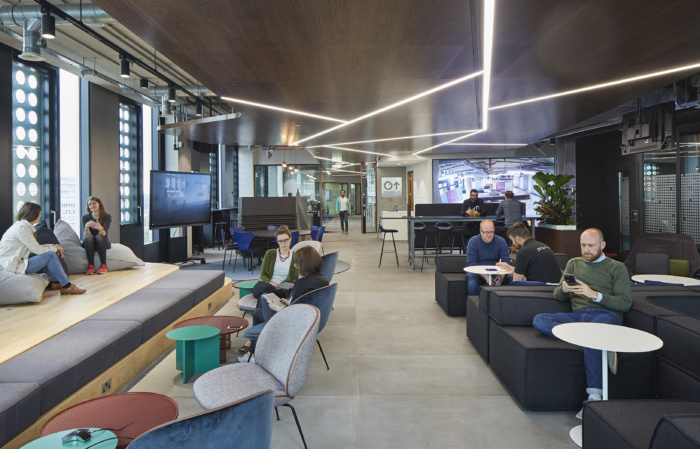 Capital One UK has unveiled its new, state-of-the-at office across two floors in the White Collar Factory in London’s growing tech precinct. To strengthen its presence in London, the new office is a showcase for modern agile working within the fintech industry. 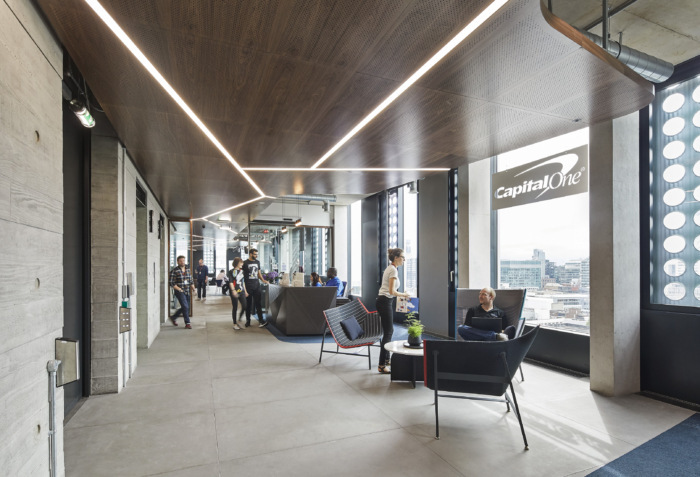 Capital One engaged HLW London to create its new space; appointing them to conduct a full workplace analysis, develop a new and pioneering workplace strategy, design the most cutting-edge and inspiring space to work and deliver it to exceed its employee’s expectations. HLW’s workplace strategy analysis aimed to understand Capital One’s business goals and enhance the evolution of the company. A workplace strategy was developed centering on creating great experiences and supportive spaces for teams and the nature of the work they undertake; helping Capital One to push the boundaries of their working procedures by creating an environment that supports the nature of the businesses’ agile working methods. The strategy focuses on flexibility and adaptability and includes highly flexible desks that rotate to form new pairs and teams, collaborative working, meeting and visual management zones integrated to become an extension of the working area, as well as quiet focus areas and private booths to cater for individual working approaches. 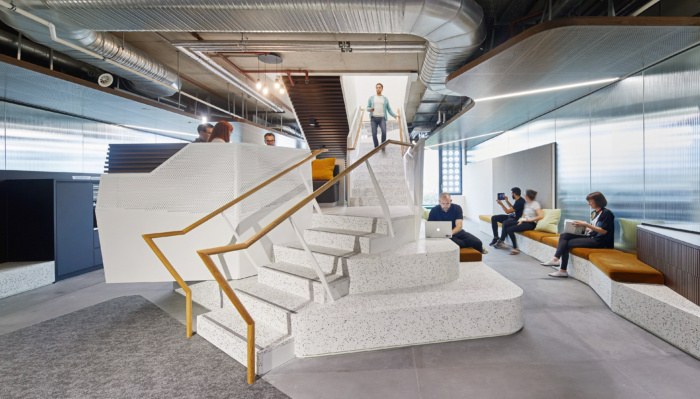 The space has a wide range of working environments to support many work styles, offering staff the freedom of choice to encourage them to flourish. This has all been carefully planned to create a connected and dynamic team atmosphere, including work areas designed to focus on individuals and individual teams; larger scale community areas, such as the communal cafe centering on bespoke feature staircase; and business and community lounge and meeting zones which can transform easily into a larger scale showcase and exhibition space which maximizes the amazing views of the city, and allow visitors a glimpse into the inner working of life at Capital One. The design concept “Paper Space vs. Cyber Space,” further celebrates Capital One through the symbolization of paper opposed to computer technology, celebrating both the history and future of the organization. Natural materials and soft curves reflect “paper space,” which is balanced against the manufactured hard materials of “cyber space.” These two themes come together to create an environment that mirrors the company’s unique work culture. The materials also compliment the architectural design and base build designed by AHMM. The creative team at HLW have designed and delivered a workspace that showcases the business while creating a fantastic space for employees to work in, enabling Capital One people to bring their whole selves to work, and showcasing Capital One as a desirable organization to work with.